I don’t know about you, but that’s a lot of ‘free’ things all in one recipe! Have no fear, though, because this recipe is not taste free. I stumbled across this recipe several years ago when I was invited to a cookie exchange at a friend’s house. 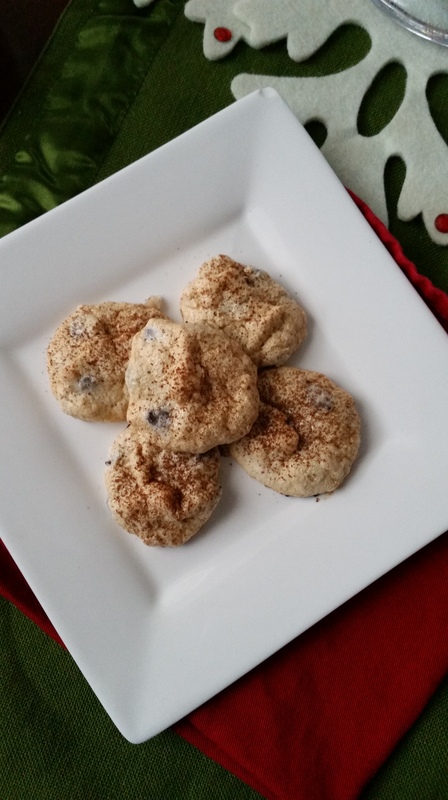 I don’t think I was Paleo at the time, but I wanted a quick and easy recipe so I could whip up several batches of cookies with a few ingredients. If you know the Paleo way of eating/cooking, you know that the ingredients can get expensive…especially when making that many cookies! Don’t get me wrong, I don’t mind making them, it’s just that not everyone is used to the taste of almond and coconut flour in their sweet treats. For most people it does take some getting used to over time (and makes me sad when I see them pushed to the side if someone doesn’t care for them). That’s where this recipe comes into play! Every year that I get invited, I tell myself that I’ll find a new recipe to whip up, ya know to keep it fresh. And every year Josh twists my arm convinces me to make these bad boys again and again. The funny is that this year I won in the category for ‘most unique cookie!’ What! What! 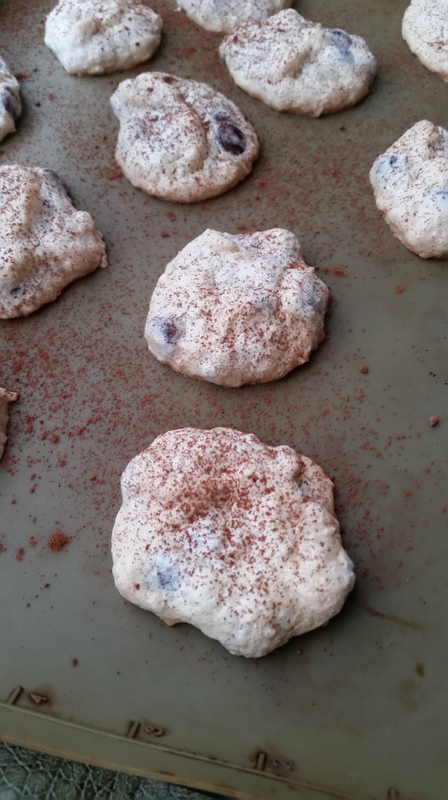 These cookies are very light and more of a meringue-not like your traditional cookie at all. If you’re ever in a pinch and need something that is free of most things, except sugar, give them a shot. I promise that you won’t be disappointed! Preheat oven to 300°F. Line two cookie sheets with parchment paper or silicone baking mats. In a chilled bowl (I chill the beaters, too), beat the egg whites until soft peaks begin to form. Slowly add the sugar, a bit at a time. Add salt and then vanilla. Continue to beat mixture until it becomes very stiff, like meringue. Using a spatula, carefully fold in the chocolate chips and coconut. Use a teaspoon (or cookie scoop) to form cookies, placing them on prepared cookie sheets. Bake in preheated oven for 20-25 minutes with the oven light on. Keeping oven door closed, watch carefully to make sure cookies don’t overly brown. Cookies are done when they are slightly golden. Remove from oven and cool on pan. Dust with a little sweetened cocoa, if desired. Enjoy! Swap chopped nuts for chocolate chips, if you can can’t do chocolate. Sprinkle additional toasted coconut on top instead of the cocoa powder.